Do you believe in the predictive power of Bible prophecy? Three years ago, Trumpet editor in chief Gerald Flurry forecasted the formation of a brief alliance between a German-led European Union and major Asian powers, based primarily on trade and commerce. This past May, the European Council on Foreign Relations, a well-respected think tank, published a revelatory report titled “China and Germany: Why the Emerging Special Relationship Matters for Europe.” It confirms the emergence of the relationship Mr. Flurry spoke of three years ago. What makes this trend so fascinating is the fact that this prediction was based on a prophecy in the biblical book of Isaiah. This unfolding scenario—just as the Prophet Isaiah described would happen in the end time—demonstrates yet again the pinpoint accuracy of the Bible’s forecasts, as well as God’s power to bring those prophecies to pass—and the urgency of our times. But the interest is far from one-sided. Overseers of Germany’s booming export economy have worried that the imposition of austerity measures on European Union economies would reduce the capacity of their major market—EU member nations—to continue buying German-manufactured goods. But with China on the scene, these worries become less relevant. “Europe’s future relationship with China—one of its most important ‘strategic partners’—will be determined to a large extent by Germany’s rapidly evolving bilateral relationship with China. Germany is China’s number one trade partner in the EU …. In short, Germany is now by far the biggest European player in China” (ibid). The relationship between Berlin and Beijing is underpinned primarily by trade and commerce. “The increase in trade between China and Germany during the last decade—and, in particular, in German exports to China—has exceeded all expectations,” the report states. The speed at which this relationship has developed is astounding. In 2010, Germany’s trade with China rose by 34 percent, to $181 billion. In 2011, that figure climbed to $190 billion. 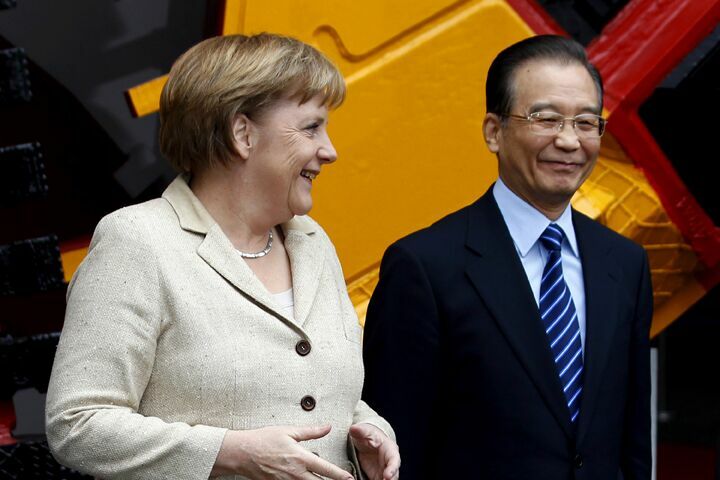 During a recent visit to Germany, Chinese Premier Wen Jiabao stated that the two nations want it at $280 billion by 2015. In 2011, Germany’s gross domestic product grew by 3 percent, with exports to China alone contributing half a percentage point. These days, almost half the EU’s exports to China come from Germany. Meanwhile, China is set to overtake America as the biggest destination for German exports outside the EU. “At present, there is an almost perfect symbiosis between the Chinese and German economies: China needs technology and Germany needs markets” (ibid). The drama intensified in February when German Chancellor Angela Merkel made a crucial visit to Beijing. Immediately afterward, the Chinese began investing heavily in Central and Eastern Europe. China forms a gargantuan customer base for German industry. Not only was it stimulated by German investment in the years of reconstruction following its breaking loose from the economic stagnation of the Soviet era, but the revived economies of Central and Eastern Europe have relied heavily on German imports ever since. However, as austerity measures imposed on EU member nations have started to bite deep into these economies, orders for German goods have diminished. With Germany deeply involved in directing the handling of the ongoing euro crisis, Berlin’s most obvious solution to shrinking export demand was to lobby China to invest in Central and Eastern Europe, thus enabling those economies to again stimulate demand for German products. The futures of Germany and China, the world’s most dominant trading nations, have become inextricably intertwined. Such political cooperation bodes poorly for the U.S. because both Berlin and Beijing often oppose Washington, particularly on global economy-related issues. Unlike America, German and Chinese economies depend heavily on manufacturing and exports; in fact, Germany and China are the world’s top two exporters, which makes them natural partners in entertaining solutions to the global financial crisis. However, this loose alliance against America goes beyond trade. “China has for a long time wanted a multipolar world in which U.S. power is limited by the emergence of other power centers.” From Beijing’s vantage point, “Europe plays a key role in … thinking about multipolarity” (ibid). Strategically, China welcomes a strong Europe to counter America. And unlike America, a German-led Europe has no military bases or direct military interest in Asia, so China doesn’t consider a militarized, politically strong Europe a threat. That Europe—particularly Germany—is prepared to ditch America for China was spelled out in another recent report out of Europe. This report also showed the potential a China-Europe pact would have in besieging America economically. In a June 19 analysis, the European Union Institute for Security Studies (euiss) advocated a closer Europe-China relationship to help in solving Europe’s debt crisis. The euiss is a European Union agency operating under the EU’s Common Foreign and Security Policy and provides analyses and forecasting to the High Representative for Foreign Affairs and Security Policy. As such, its reports carry considerable weight. Earlier in the year, another EU institution also recommended closer Europe-China ties, saying collaboration in science and technology should be “at the heart of bilateral cooperation.” The EU-funded Europe-China Research and Advice Network stated, “China poses no military threat to Europe” and that this fact “promises to benefit the EU in its engagement with China.” It suggested that concerns about human rights should be put aside in order for the EU to engage China more. The direction such influential EU institutions are leading is a powerful indication of the beginnings of the fulfillment of prophecy about the economic and literal besiegement of America in the end time. Isaiah’s prophecy is marching toward fulfillment. It links with parallel prophecies in Ezekiel and Revelation to clearly depict the interdependent relationship building between Germany—and China. And it reveals the startling outcome of these trends. Chapters 22 and 23 of Isaiah identify these two great markets in a few different ways. In Isaiah 23:1, China is called by its ancient name, Chittim. The same verse calls the German-dominated European Union by the term used to describe a major economic power extant at the time the prophecy was written, ancient Tyre. In this prophecy, the great northern trading power of today (of which Tyre, consistent with biblical typology, is depicted as a type) is shown in relationship to China, the sea (verses 2, 4, 11), oceans (“great waters,” verse 3) and ships (verses 1 and 14), mentioned in relation to seaborne merchant traffic (verse 8)—all within the context of a great international market. Isaiah 23:13 mentions Italy under its ancient name, Chaldea. Italy is here depicted in association with Germany, whose biblical identity is Assyria, or Asshur. An associated prophecy in Ezekiel 27:1-6 again uses maritime terms in association with merchants enacting trade via the sea between Tyrus (called “king of the north” in Daniel 11) and the Ashurites (Germany) in association with Chittim (China). The theme continues in relation to the main subject, Tyrus, a type of the prophesied king of the north, in verses 8-9, 12 and 22-25. Nations mentioned in verse 21, in the context of trade with Tyrus, bring to mind the Arab-Germanic alliance described in Psalm 83. Still others, especially Greece (Javan), now a virtual vassal state of the German-led EU, and Russia (Meshek and Tubal), hugely exposed to EU debt and greatly dependent on German exports, are also mentioned in verses 13 and 15. Japan and Southeast Asia (Togarmah) are also brought into the equation in verse 14. This all bespeaks a massive trading power having open access to sea gates for global trade and a powerful linkage with China at the prophesied “latter days” (Daniel 10:14). Taken in context, the prophecies of Isaiah 23 and Ezekiel 27 align perfectly with those of Revelation 13:16-17 and Revelation 18. These all point specifically to the current interdependence of the world’s two major trading blocs—the German-dominated EU and China. In his booklet Isaiah’s End-Time Vision (request your free copy), Gerald Flurry outlines what this alliance portends for the U.S. in particular: “The Bible contains many prophecies of [a] European power attacking America—and many other prophecies of America being besieged. That’s right! This Euro-Asian partnership is prophesied to lead to the destruction of the United States and Britain! It’s early, but there is no doubt that a German-Chinese alliance is forming. Perhaps some mock us for letting Bible prophecy inform our analysis of world events. But it’s getting harder and harder to deny the facts: Germany is the unchecked leader of Europe; Europe is transforming into a German-designed creation; and relations between Germany, China and Russia are getting healthier and stronger. And let’s not forget the larger, more important fact: that all three of these trends were prophesied, and that world events, yet again, are proving the Bible as the “more sure word” of God!